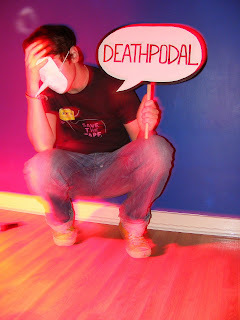 Deathpodal is 27-year-old Alastair J. Chivers, a solo multi-instrumentalist based in Glasgow. On the 29th of March he releases his debut EP "Exu__Wow", the first release from new independent Scottish label Electropapknit Records. Exu__Wow was recorded in a host of different locations, from a portacabin in Stonehaven to the streets of Prague, and features members of Copy Haho and PVH. The end result is quite staggering! 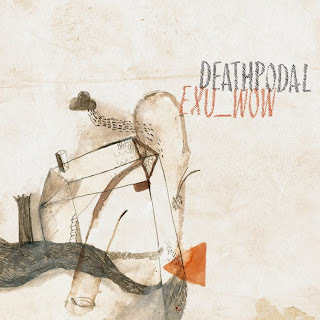 In little over 20 minutes Deathpodal has managed to cram in eerie, crunching guitars and sheer noise that Sonic Youth would be proud of, and a fair few mellower moments where strings, organs and metalwork fuse together in a tangled mesh that borders on melodic. A great balance between the two, it really is an EP to stick on, lie back and lose yourself in. In a slightly warped but wonderful way, his pained cries of "I'll bring you joy" on "Every Superstition Shall Be Removed" sum up the EP for me. Can't wait to hear more. Cracking stuff! Keep your eyes peeled for some upcoming full band gigs in Glasgow before a tour gets under way in the summer.